Makes ordering your coffee drink easier. Helps the environment. And does both for free! Save time by printing your sleeve covers onto our blank self-stick sleeve labels. Two labels per sheet. These labels work with your color printer and all of our sleeve cover PDF files! Print some for your friends and family! If you like Sleeve Savers and think other people would too, will you do us a favor? Marketing is very expensive, so if you could print out this flyer (5MB .pdf) , cut the little tabs at the bottom with scissors, and then post this at your local coffee shop's community bulletin board, that would be very helpful! That way people will have a convenient way to remember our website address... they just tear-off one of the little tabs at the bottom. Also, if you'd like to let others know about our website by email, please use our email a friend feature. Let all of your coffee-loving friends know about us! Graphic designers are welcome to submit entries into our monthly contest. The winner of each month's contest, as determined by our staff, will receive a $50 Starbucks card. Each entry will also be listed with the graphic designer's name and website (or email), if desired. Each entry becomes the property of Sleeve Savers, although the graphic artist is free to use the entry in their personal portfolio. 2. Download and complete this Submission Agreement. 3. 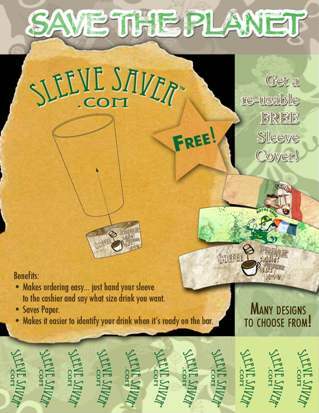 Design your sleeve based on the instructions in the template. 4. Send your finished design with all fonts outlined and all artwork embedded, as a .jpg file, to the email address in the template. Include the completed and signed Submission Agreement form, either scanned as a .pdf or .jpg or .tiff file, or fax to 1-800-399-0181, or mail to the address on the agreement..
Congratulations to Bryan Prince of Bryan Prince Design, our last month's winner of a $50 Starbucks card. His winning design... "Coffee Freak."